As an industry leader, we have introduced many new products and features into the marketplace. 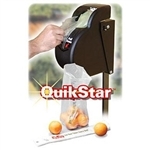 Our patented QuikMate EZ open feature continues to be the standard for self-opening plastic bags. Other key innovations and patents include specialized bag features and dispensing hardware. All of our products and services are focused on practical solutions in our target markets. Plain Mini T-Sak Bag 13 Mic White - 9 in. x 6 in. x 18 in. White Mini T-Sak Bag 12 Lb. - 9 in. x 6 in. x 16 in. Produce Bag HDPE 6 Mic Clear - 15 in. x 20 in. Home Depot T-Sak 13 Mic Kraft - 11.5 in. x 6.5 in. x 20 in.